The numbers never told John Elway’s story. His overall statistics are impressive, but his true measure as a player ran straight to his heart. It took two championships at the end of his career to certify his stature, to soften the mark of three Super Bowl losses. After 16 seasons, Elway retired as the starting quarterback with the most wins in NFL history with a 148-82-1 record. He was inducted into the Pro Football Hall of Fame in August of 2004. A renowned scrambler, Elway led 47 winning or tying drives in the fourth quarter or overtime, more than any quarterback. “In tight situations I stop worrying about turnovers,” he said. Elway became the first quarterback to start five Super Bowls, was selected for the Pro Bowl nine times and in 1987 was voted the NFL’s Most Valuable Player by the Associated Press. By taking risks as a passer, he made plays other quarterbacks couldn’t. John Elway closed his career with an MVP performance in the 1999 Super Bowl. Elway was born in Port Angeles, Wash. Growing up, Elway participated in several sports. After moving to the Los Angeles area, Elway starred in baseball and football at High School. Batting .491 as a senior, he led his team to the city baseball championship. As a quarterback, he was a prep All-American, receiving scholarship offers from 60 colleges before choosing Stanford University. While at Stanford Elway set Pac-10 career passing records for completions, yardage and touchdowns. Said Stanford coach Paul Wiggin: “Every team we play puts up a picture of John and says, ‘That’s our battle cry.’ “Elway was a consensus All-American as a senior in 1982, when he passed finished second to in the Heisman Trophy voting. The Baltimore Colts made Elway the No. 1 pick in the 1983 draft. He used baseball as leverage. The Yankees drafted him in the 1st round. Fearing Elway might turn to baseball, the Colts traded his rights to Denver. After signing a five-year, $5-million contract with Denver, Elway became a much-admired starter. In the AFC championship game in Cleveland, Elway did something remarkable when he took Denver on “The Drive,” a tying, 98-yard, 15-play march late in the game. The Broncos defeated Cleveland in overtime, but then lost the Super Bowl to the New York Giants despite Elway’s best effort. He became the first quarterback since Pittsburgh’s Terry Bradshaw (1978-79) to lead a team to consecutive AFC titles. Elway got his chance in 1997 when the Broncos team rode to the Super Bowl as a wild card. Facing the defending champion Green Bay Packers, Denver ended the AFC’s Super Bowl slide with an upset. “That was the ultimate win,” Elway said. In January 1999, the Broncos were again in the Super Bowl, this time against Atlanta and his former coach. Reeves’ game plan: Stop Davis and let Elway beat us. By throwing for 336 yards and one touchdown-and running for another score-Elway led Denver to triumph. “I don’t think there’s any doubt now that he’s a winner,” said his father Jack. For 16 amazing seasons-234 games that included a NFL-record 148 wins-John Elway was the undisputed leader of the Denver Broncos. He will be forever remembered for his 47 game-winning or game-tying drives in the fourth quarter (another NFL record), his spectacular passing statistics, and his enduring competitive spirit, which led him to ultimate professional and personal triumph in the Super Bowl. 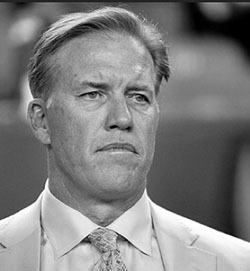 In 2004, in his first year of eligibility, John Elway was elected on the first ballot to the Pro Football Hall of Fame. On August 8, 2004, John will be officially inducted in Canton, Ohio, along with fellow superstar classmates, Barry Sanders, Carl Eller and Bob Brown. John Elway resides in Englewood, Colorado. He keeps very busy, dividing his time between his family, business interests, and the Elway Foundation, a nonprofit organization John started in 1987 to assist in the prevention and treatment of child abuse. Since his rookie year, John Elway has been very active in the Denver community. In 1987 John decided to start his charity foundation, the Elway Foundation, to join with the community’s efforts to eliminate the dreadful crime of child abuse. John recognized that child abuse was a growing issue in our society and was affecting more and more lives. He made the decision to concentrate the Elway Foundation’s efforts in the area of the treatment and prevention of child abuse and to hopefully prevent future generations from becoming victims of this horrible crime. John Elway’s second charity is The Heroes Foundation. Heroes Foundation was created to provide support and funding to America’s heroes and their families. Heroes exist everywhere. The Foundation strives to encourage American pride and assist those Heroes, past and present, who contribute to improving society and defending our country’s freedoms. The Foundation will fund numerous programs which recognize the extraordinary sacrifices people make to in order to keep our country great.